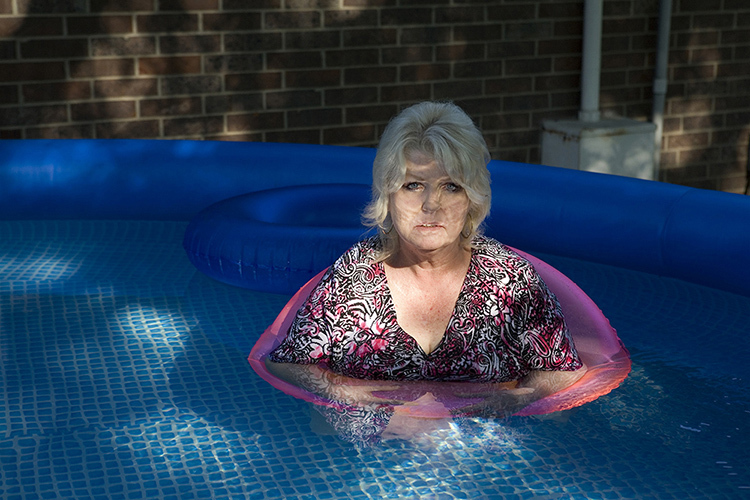 fototazo: The Image: Daniel Coburn, "Mom Cooling Off in the Inflatable Pool"
The Image: Daniel Coburn, "Mom Cooling Off in the Inflatable Pool"
Daniel Coburn: In the summer of 2011, I decided to visit my family after a year-long hiatus. I arrived on Independence Day. My father was turning steaks on the grill and my mother was bobbing around on her floatie in the inflatable pool. The evening sunlight sparkled through the trees, onto the surface of the water, and reflected subtle shimmers of light onto my mother’s face. It was a poignant moment. I grabbed my camera and asked her to directly address the lens. I made about twenty exposures, directing her through the light as it filtered through the leaves overhead. This moment, and the resulting photographic image, embodies my mother’s presence, which is simultaneously menacing and fragile. I immediately realized that I could use photography to elaborate on my personal history and memory as it relates to this place and these people that I understand so intimately. After this, every other artistic impulse seemed disingenuous and I began making a series of family portraits that now represent my body of work "Next of Kin." In "Next of Kin," I use the camera to transform my family members into mythological characters. I use beauty and craftsmanship to seduce my viewer into a dark family narrative. I use the camera to elaborate on the complex relationship of my parents. I photograph the children in my family to revisit my own childhood, which exists only as a set of fleeting, enigmatic images in my aging memory. I hope that the viewer is able to contemplate the complexities of these relationships in dialogue with their own family experience. My intent is to craft these portraits in a way that makes them accessible. I hope that my audience can relate and perhaps see a bit of themselves or loved ones in each of these photographs.